If you are searching for a home inspector in Fayetteville, Newnan, Griffin, Hampton, or other areas of Georgia , I understand that you have many options when it comes to home inspectors. That is why I would like to explain to you why we here at Blueprint Inspection are your best choice. My wife and I provide you with a thorough and comprehensive home inspection and report. We work together to provide you with a more complete inspection. You have two inspectors on site to provide you with two experienced perspectives and sets of eyes. My wife and I realize that this home, or building, you are purchasing is a huge investment, and it is our job to do our best to protect your interests. If you are looking for a home inspection, you have come to the right place. 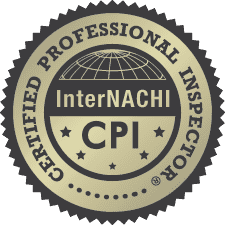 I am an InterNACHI Certified Professional Home Inspector who cares deeply about his trade. I inspect every home as if it were for my own family. I have built my reputation and my career on being thorough, clear, and hard working. So feel free to contact me and I will be happy to provide you the best inspection possible! Here at Blueprint we take our duty to you as your home inspectors seriously. Our complete home inspections are a thorough, top-to-bottom, 400 point home inspection, to help you fully understand the condition of your future home. We don't like to leave things up to guess work, and we are confident you will be as happy with our services as the rest of our clients! We inspect it once, and inspect it right! Home Inspections in Georgia: Spalding County, Henry County, Fayette County, Lamar County, and Coweta County, including, but not limited to, Fayetteville, Newnan, Griffin, McDonough, Senoia, Peachtree City, Sharpsburg. Fairburn, and Hampton GA.
"Very professional, friendly, and informative. Would highly recommend Blueprint Home Inspection." "Blueprint Home Inspection did a thorough inspection. He was very much the professional. He answered all questions and concerns we had and we would highly recommend him to anyone looking to have their home inspected. He knows his trade and we appreciated his expertise." "I met Lee with Blueprint Home Inspections when my client searched him out and told me that he would be doing the inspection. I typically recommend only a handful of inspectors that I use when I am asked. I am never opposed to my clients choosing one on their own. Upon arriving at the property to meet with Lee, I was pleased to find his crew already there. Lee presented well, and was very well mannered. Lee even provided me with a copy of his insurance papers to show he was covered. Lee uses all the latest in technology to do his inspections. He is able to send the report from the premises through his iPad. He walked my clients and I through the property to give us a visual tour of what we would see in his report. Lee is also very competitive on his prices. Since meeting Lee, I have used him several other times and now Blueprint Home Inspections is one of the handful of inspectors I recommend if asked. You will definitely be pleased with his service." "When I was trying to buy my home, I wanted an inspection done before my closing. Lee was the only one who was willing to move his schedule around for me to have my report before my closing date. Which I believe was awesome, not a lot of people would be willing to do that. He was also very professional in providing me with information pertaining to all my questions, as I am a first time home buyer. Lee even helped me with questions regarding my home that were not included in the report, very professional. He made sure I was pleased with his service and even called to check up on my purchase status. From now on I will refer all my friends to Blueprint Home Inspection. I was very pleased with my inspection experience. Thank you so much for such good service. God Bless You And Your Business!" "Able to book quickly. Inspection was professional and complete." "Lee and his wife did a great job! They wasted no time getting started and did a very thorough inspection of the property. The report that he submitted back was clear and he highlighted all issues that needed to be addressed. Would definitely recommend!!" "I am a first time home buyer, and had no idea where to start when it came to inspections. My fiance came across Blue Print Home Inspections website, and we thought it looked very professional and upfront about services provide so we took a shot and called Lee. He was able to come out on a Saturday, since our due diligence was quickly running out. Him and his wife met my fiance at the property while I was at work, and began their detailed report. The most vital part of my home inspection report became the pictures. There was a very serious moisture problem in the crawl space that needed to be addressed, and it was at the top of Lees list of concerns. Since I was at work I had many questions, I emailed them to him, and promptly my phone was ringing. He walked me through everything, and made some recommendations on who to call out to further investigate. This turned into three inspectors telling me I was looking at a potential foundation issue! If it weren't for Blue Print's thorough analysis, and willing to go beyond my expectations I may have made a very costly mistake. I believe it was exactly what a home inspections should be. Blue Print used their knowledge to protect the buyer, which is priceless to me. I will always call Blue Print for any of our future home inspection needs!" "Lee did an excellent job and I highly recommend him! I will absolutely call Blueprint Home Inspection for any future homes I buy in the area. I am very happy with the detailed report, the value for money, and the customer service. I cant fault my experience at all."